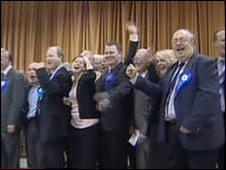 The Conservative Party has won control of Harlow council, but lost power in Colchester in the local elections. At Harlow Council, where previously no party had overall control, the Tories gained five seats, while Labour lost two and independents lost one. The new council will be made up of 18 Conservatives, eight Lib Dems, six Labour members and one vacant seat. At Colchester Borough Council, there is now no party in overall control. The Tories have held on in Rochford. The party also held on to Basildon, Brentwood, Castle Point, Epping Forest and Southend. Thurrock council, where the British National Party made one gain, remains without any one party in overall control. Bill Rammell, Labour MP for Harlow, said it had been a disappointing night for the party. "We struggled to get our vote to come out," he said. "People do have concerns... clearly the tax change on 10p didn't help us." 159 of 159 councils declared.